In the July/August 2001 edition of the Roper Center's Public Perspective, Washington Post national political correspondent Thomas Edsall summarized the findings of a Kaiser Family Foundation poll of 301 'media professionals,' 300 'policymakers' and the 1,206 members of the public. The media professionals included 'reporters and editors from top newspapers, TV and radio networks, news services and news magazines.' 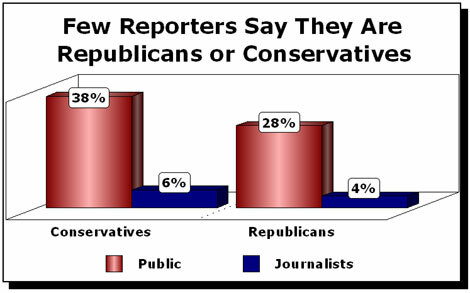 The results showed that 'only a tiny fraction of the media identifies itself as either Republican (4%), or conservative (6%),' placing reporters far to the left of media consumers. Four times as many 'media professionals' told the pollsters they considered themselves 'liberal' (25 percent) than called themselves 'conservative' (6 percent). Among the general public, self-identified conservatives outnumbered liberals, 38 percent to 21 percent. More than six times as many media professionals called themselves Democrats (27 percent), than said they were Republicans (just 4 percent). Among the general public, Democrats slightly outnumbered Republicans, 34 percent to 28 percent.